The other day I sent out my regular weekly email to subscribers (if you're not a subscriber - become a subscriber here!) with a recent blog post and I asked y'all to tell me of any other posts you'd like to see. This question came from Lauren, so thanks Lauren so much for helping out with this blog post idea! Lauren asked what the top lessons I've learned in business were - so here goes! 1. Your niche matters! Like, a freaking lot! Straight up, I cannot, cannot, cannot describe how important going narrow and deep into a topic matters when you're getting started. I first heard about niche's back in my travel blogging days when I took the Travel Blog Success course. To be honest, I was so not down to pick a niche and pushed back hard on the idea. "If I niche into a specific type of travel (eg. solo, budget, luxury, eco-friendly, etc.) I can only do that type of trip then and I don't want to always do the same thing; I want to vary up my trips! If I go niche into being an expert on a certain travel destination, then I can only be in that place and write posts on that location" I thought. Then I wandered my way to a travel blogging conference and I was smacked with the importance of a niche. Everyone asks 'what's your blog about'. I quickly realized, it was straight up just 'inspiration' and following me wherever I went. Talk about useless. I mean, yeah if I was Beyonce, people would be down to follow me on my travels no matter what, but I'm afraid to say, I'm not Queen B, so no one cares. The only way I was going to make my travel blog interesting to anyone other than my mom was to go niche and provide valuable information on a topic that people need. While I never kept the travel blog long enough to pick a niche and kill it, I learned my lesson before I went into starting this web design business and knew I had to pick something. When you pick a niche, you make yourself the only option for your ideal client and they will line up around the block to work with you. You'll also build a waiting list of potential clients. Another example of a fabulously niche business, (background info if you don't know, I'm a Canadian expat who lives in Germany and I run my own online business), there's a financial advising company in Germany that specializes in working with expats and people who run their own business. Talk about jackpot! Basically, they provide exactly what I need. The company speaks my language so I don't have to go through the nightmare of figuring out investments in German (could you imagine ðŸ˜³ - I swear every German investment word is 95 letters long - if you didn't know, Germans basically turn full sentences into one word), the company get the difficulties of cross-border investing, not knowing your final retirement destination, and have been through my situation 12 zillion times. Am I going to work with them or random Joe down the road from me? Nope, no Joe for me. I'm going to drive 3 hours to the expat-specific office to work with the company that specializes in exactly what I need. They might be in a more inconvenient location, they might be more expensive and I honestly don't care, because they have what I need and get me and my unique situation. That's a killer niche! Yep, that financial advising company will probably not get a single German to work with them, but all the expats in Germany will be dying to get an appointment. While they're repelling some people, they're attracting others in droves. A word of advice. Once you pick a niche and become an expert on your topic, you can expand out and grow. But you've gotta start small and specific to get momentum going. So start small, specialize in one thing or one type of client, or one style and then over time go more broad. If you remember from when I started my business, I was a hot mess when I started. I tried going full-time and completely sabotaged myself. I was soooo stressed. I went right back to working for someone else just 2 weeks after going full-time and was miserable in my job knowing I had so much more to offer the world, and was so annoyed with myself for royally screwing it all up. When I went full-time the second time, I was determined to do it right. I decided on one marketing strategy (blogging) and stuck. to. it. I forced myself to leave the house. I joined a co-working space. I read all the personal development books, meditated daily, told negative thoughts that would float into my head to screw off and started exercising. I stopped sabotaging myself, and it freaking worked. So take care of yourself. If feel like a hot mess and you're wallowing in a pity party of your problems instead of taking the glass-half-full approach, your business isn't likely to last long. 3. Your second most valuable asset is your email list, so build it and treat subscribers like gold! Product or serviced-based businesses need an email list, that I'm very confident in. I can tell you that my email list has booked out my client design spaces and sold almost all of the seats to my course. I think up a webinar idea, send one email and bam hundreds of registrants! It's kinda like online business magic. My email list has been directly responsible for thousands and thousands of dollars of sales in my business this year. I haven't added up the numbers specifically, but if I had to take a guess, I'd say my email list has been responsible for well over 50% of my sales this year alone. When you have an email list, you're no longer launching new products and services to an empty room, you're not fighting with an algorithm and your stuff isn't getting lost in a long feed that gets scrolled by in an instant. When you have an email list, you're no longer shouting into a black hole until you're blue in the face. You get directly into the inbox of people who actually care about your topic and have granted you the very generous permission of contacting them directly. If I had to name the second most valuable thing in my business (after me - the most valuable asset because I'm the one who does the work) I'd absolutely say my email list. 4. Building your own business means being able to be yourself, and people love it! I'm sure if you've worked at a corporate job you know what it's like to leave your real self at home and turn into your weird, responsible, upstanding citizen, white-picket-fence, corporate self at work. Gonna be honest, I'm not a fan of being one person at work and one person at home. Yeah, there's downsides to being a one-woman-show type business. Having to do your own finances, taxes and legal work is right up there at the top of that list for me. But when it comes to customers, there's a significant upside to you just being you. You're relatable. You're normal. You're human. People feel that they get to directly build a relationship with you, that you get them, and that they'll get the attention they deserve when working with you. A corporation can't offer that. So being yourself is actually a massive advantage! So feel free to let your freak flag fly and be down-to-the-core yourself in your business, because that's going to resonate with the people just like you. To drive this point home, I'm gonna take my girl Jenna Kutcher as an example here. I know y'all love her, as I do, because the last time I held subscriber chats, every single one of you mentioned loving Jenna too. We both love her podcast and how we feel like we can relate to her so well. But we realized, the two of us have very little in common with Jenna. Jenna is American. She married young. She's religious. She's a photographer. I'm not American. I'm didn't get married in my early 20's. I'm not religious, and I'm terrible at taking photos. We have very little in common really, but I feel like I get her and she gets me. It's because her personality and authenticity shines through everything she puts out there into the world, and so while on paper we may seem super different, I still feel that I relate to her. When you're your true self, people build a deeper connection to you and you attract your perfect, dreamy clients and customers to your business. Every day online we're loaded up with things we 'should' do in our business. And while a lot of info online is super valuable, and tactics have truly worked for others, I've learned that it's best to decide on my direction, then put on my blinders and block out everyone telling me what I just need to do. If I tried running a blog, YouTube channel, podcast, weekly webinars, Facebook, Instagram, Pinterest, Twitter, email list and all the rest of it, I'd legit have no life and feel like I was getting nowhere fast cause I wouldn't be making progress with anything. I think it's valuable when you're getting going to see what's worked for others, choose a direction and then start running. Once you've chosen your direction (eg. marketing strategies, ideal client, service or product offerings, etc. ), just focus on that. Set yourself an amount of time you're going to focus on one strategy before you switch. Switching your direction every week is not going to lead to success. Yes, take in all the info and advice at first, but then pick your direction, put on blinders and just go for it. Absolutely nail one marketing strategy, service or product offering and you'll do just fine. You don't need to do everything under the sun from the start. Speaking of which, the book Good to Great (that's an affiliate link friends!) absolutely spoke to my soul and lit off a few lightbulbs related to this if you're interested in learning more. 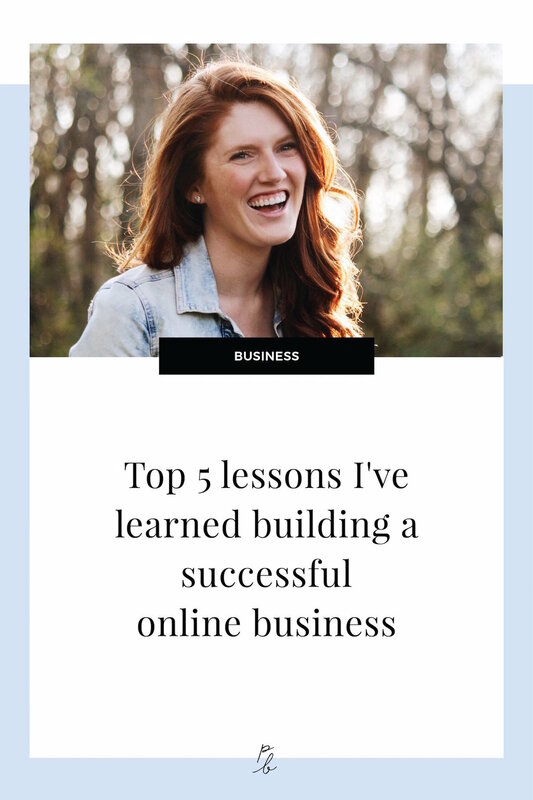 Okay, there you go, those are my top 5 lessons learned through running my online business!